Posted on December 15, 2009	by Lou Murray, Ph.D. 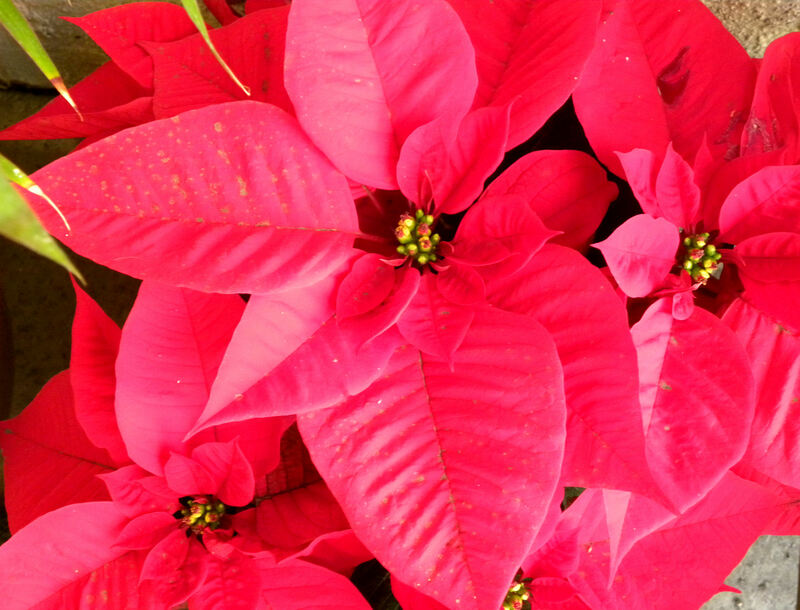 I buy a couple of pointsettias right after Thanksgiving to remind me that winter is upon us. Although they will grow year round in the ground here, these are disposable plants for me. It only seems like we don’t have seasons in coastal southern California. We don’t have spectacular autumn foliage. We don’t have snow. We can have sweater days in June and shorts days in December. But we do have seasons, subtle as they are. Our two liquid amber trees turn color and drop their leaves in December. Those leaves are like gold for my compost pile, and I hoard them. We have winter flowers, spring flowers, summer flowers, and autumn flowers. Each season has its own palette of plants that bloom. December isn’t a prime flower month in my drought-tolerant yard, but I thought I’d show you what’s in bloom now. Iris aren't supposed to bloom for another couple of months. This crazy "Grandma's Purple Flag" is blooming now. More evidence of global "weirding." Most of my paperwhite narcissus that have naturalized are just now popping up. One crazy clump has already finished blooming. Global weirding. Yarrow is both drought-tolerant and a California native plant, a plus in my book. My roses would be in bloom now if they got more sun. I pruned them back in November and am getting lovely new growth now. They'll bloom later. Bees and butterflies like this lantana. I planted it at the edge of the Garden of Perpetual Responsibility to attract pollinators. Gazania comes from South Africa. It's drought tolerant and blooms year round. Nemesia is one of my favorite flowers. These cheerful little things bloom all year long and naturalize, reproducing themselves so I don't have to buy more of them. Love this plant! 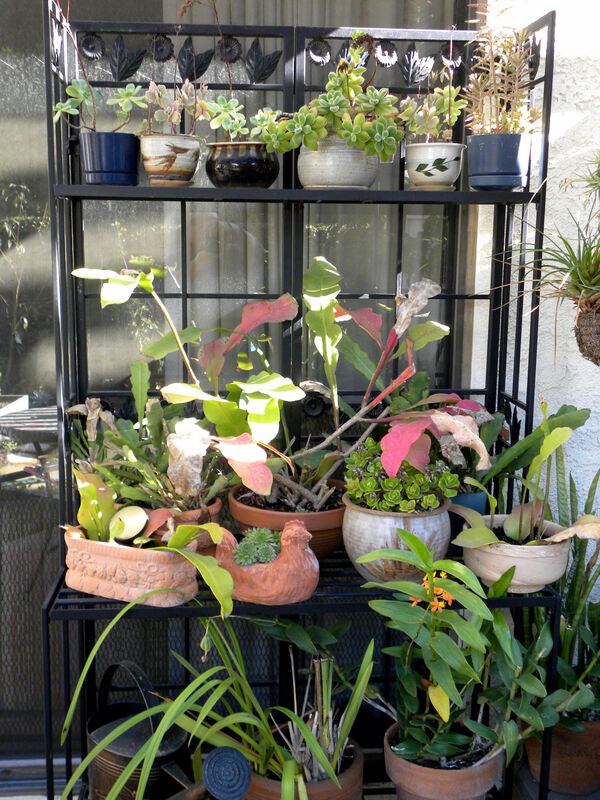 I had such a clutter of little plants in pots that I got this nice rack from the Improvements catalog to hold them. This is my favorite place to sit and rock, listening to the fountain and looking out over my raised garden beds. Black phoebes and wintering warblers forage for cabbage worms, so there is always something to distract me from reading. I also have lavender and rosemary in bloom, as well as one crazy branch of my Granny Smith apple tree (more global weirding). December is a slow month for flowers in the yard, along with the hot, dry days of August and September. But all in all, it isn’t bad. I’ve chosen the plant palette so that there is always some nectar for the bees and butterflies. Spring comes early here, arriving in February and lasting through April. I can hardly wait to show you my spring flowers, especially after all that work planting bulbs and rhizomes the past month. Take heart New Englanders, Canadians, Germans, and others from the frozen north. Spring will come again. 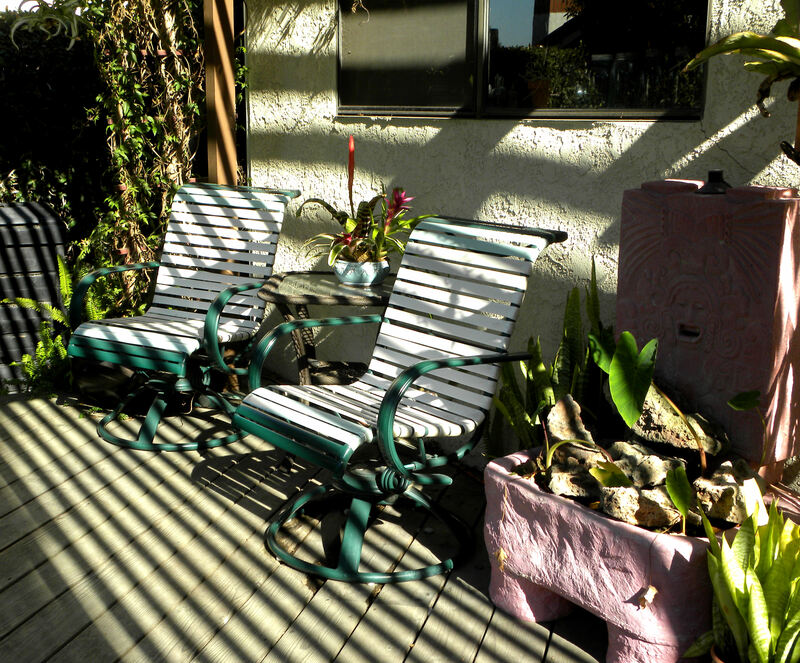 This entry was posted in Uncategorized and tagged flowers, gazania, Improvements, iris, lantana, lavender, Nemesia, paperwhite narcissus, poinsettia, rose, rosemary, seasons, southern California, winter flowers, yarrow. Bookmark the permalink. I am sure the pollinators appreciate your year-round buffet of blooms. And I will be looking forward to seeing spring in your garden, since it will be a couple of months later here in So. Indiana. Hi Villager. Hoosier springs are so much more enthusiastic than our springs. I look forward to seeing more of your garden as well, no matter what the season. What a welcoming surprise to find in my inbox this morning…. It was a lovely 12 degrees in Indianapolis this morning…. Hi Tonie. Ug, 12 degrees. I remember Hoosier winters. Not fun. We can see snow from Huntington Beach, but it’s on the mountains that ring our coastal basin. High temps here are going to be in the 70s this week, with lows all the way down in the 40s. Bet I get no sympathy. I am delighted to stumble across your blog. Your December 15, 2009 post has been helpful to me and I have a few questions since reading it. I live in Santa Ana, CA, and am planning for our wedding on January 1, 2011. On our shoestring budget, I hope to grow all of the flowers myself, with the help of many friends. Our colors are black, purple and white and I’d love to have purple and white flowers for all of our arrangements. Given your experience and expertise, what would you recommend that grows easily from pots in time for a January 1st harvest, in white and purple? The iris pictured is lovely, and so is the lantana. I have little knowledge about flowers in general, let alone what grows when. Do you, or any other readers, have any recommendations? Thank you so much for any feedback you can offer! Wow, Ruthie, that’s a challenge. I would suggest white Freesias and white Paperwhite Narcissus. They can be planted in pots from bulbs. Check with your local Armstrong Garden Center to find out when to plant them to get blooms in January. Check out Rex Begonias for dark purple and black foliage. They might not be in bloom, but the foliage is spectacular. If you use black paper and purple ribbons on all the pots, it should tie together nicely. Good luck!